I like to use my watercolor sketchbook as a visual journal and that means that I use photos as inspiration for some of the pages. Here are several of those pages from the last month. 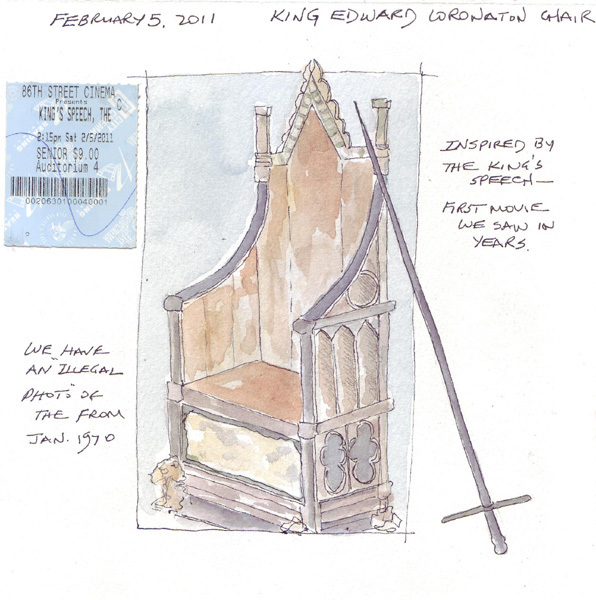 To create a page for the day we went to see the movie "The King's Speech" - I did a drawing of King Edward's Coronation Chair. We have an illegal photo from 1970, but I used an official photo found on the internet for this painting. We took two of our grandsons to the Museum of Natural History last week and saw the live butterfly exhibit and ALL of the dinosaurs. 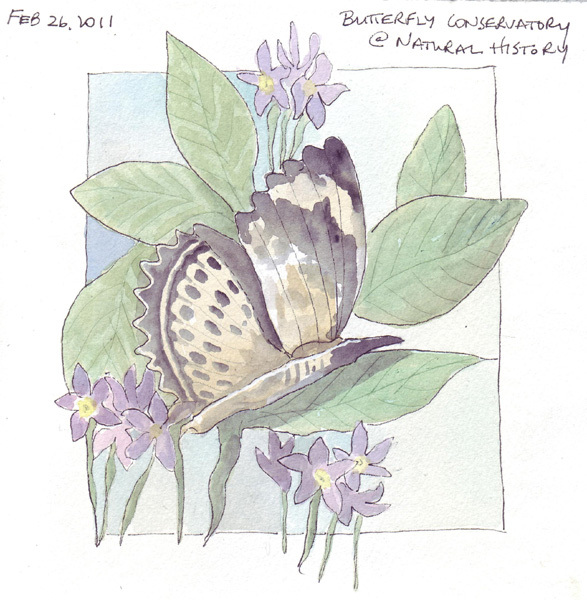 I took a few butterfly photos as they landed on leaves near me and painted one of my favorites to remember our visit. 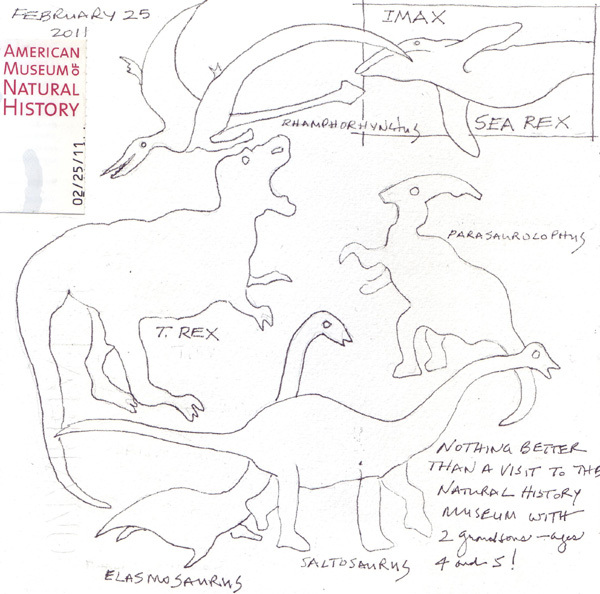 And I did some dinosaur sketches from the Natural History Museum Shop website photos to remember our tour of the 4th floor with out 2 little dinosaur experts - ages 4 and 5. We were watching The Seven Percent Solution - a Sherlock Holmes movie - on Sunday night when I started to do a journal page for the day. 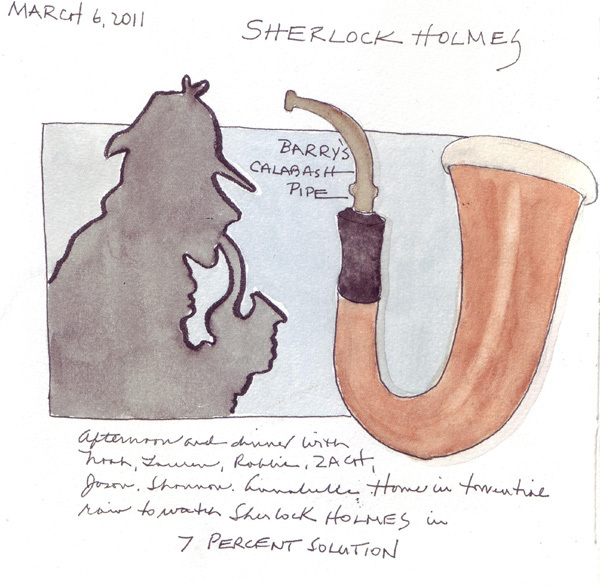 I combined a silhouette of Holmes - inspired by a web image - and added it to a drawing of my husband's calabash pipe. I love figure drawing and try to do regular exercises to help with my drawing technique. Here are 3 of my favorite, regular exercises - in addition to drawing hand photos from an American sign language website. 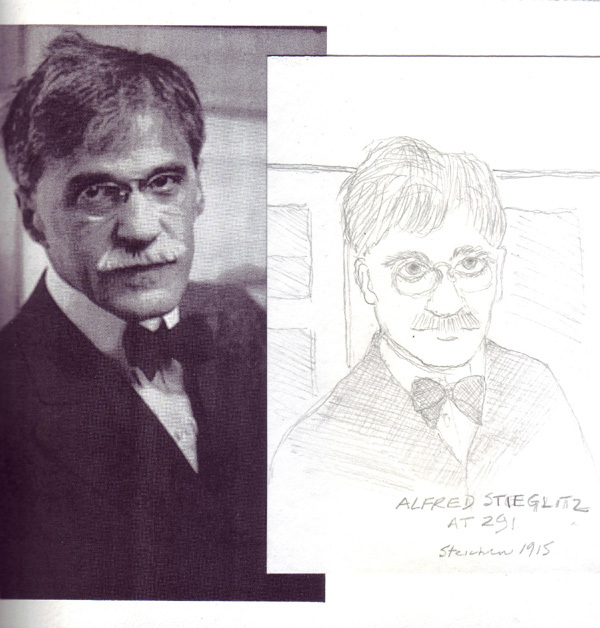 One of Carla Sonheim's Drawing Labs is to draw 100 Faces. I decided to draw most faces from live models and carry a pouch with watercolor cards, pen, pencil, eraser, 8 watercolor pencils, and the large Niji waterbrush with me when I'm I'm on NYC public transportation. 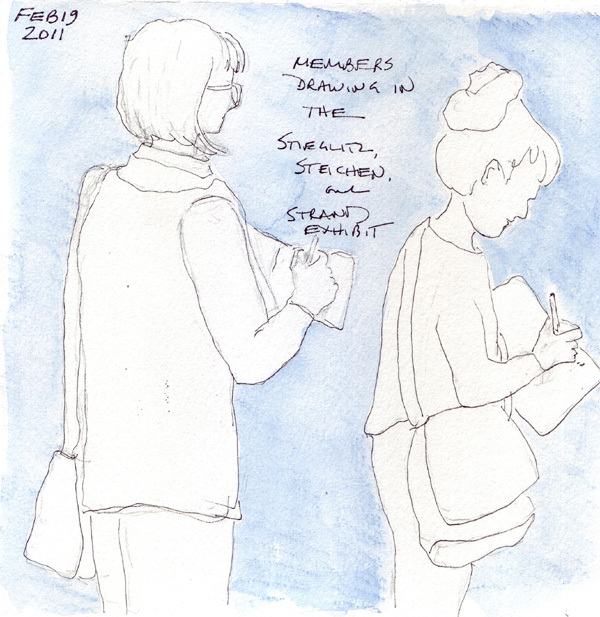 It is challenging to draw without the model knowing - or having fellow passengers comment. And sometimes the model is only in their seat for one bus or subway stop. Here are 2 of my latest. The drawing on the left was done with an indigo Prismacolor colored pencil - one of Kate Johnson's recommendations for shaking things up. I love the challenge of drawing from Posemaniacs.com - using their 90 second program. I usually will spend 10 minutes doing these drawings to warm up for a scheduled trip to Live Figure Drawing. 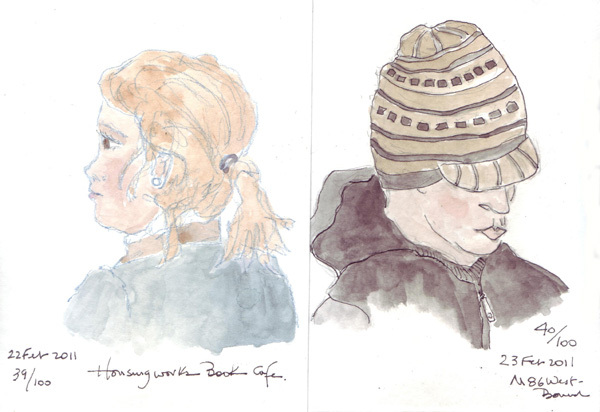 These figures were drawn with a watercolor colored pencil and then brushed with water. Someone on some blog - sorry I can't give credit where it is due - recommended this exercise for practicing portrait drawing. I look for faces in magazines that are about the size of my journal page and then cut them in half, gluing in the side I will copy. 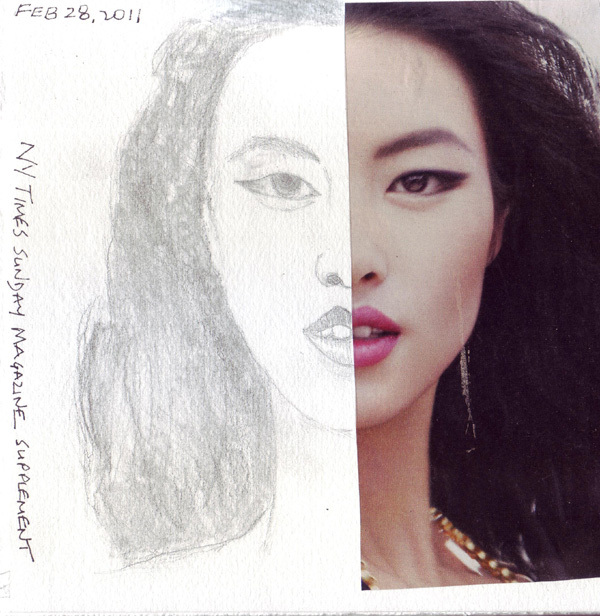 I'd love to have 5" front facing, colored photos of less perfect models (i.e. interesting faces) to draw. But I haven't found a source in color, of that size, in hard copy. I think I need to haunt the used book stores for cheap sources. Melanie Testa arranged for Carla to spend time with us between two classes that she was teaching in New York, and then Melly wasn't feeling well enough to join us. We missed her terribly, but did a little text messaging during the afternoon! Carla did Craft Night at Etsy in Brooklyn on Monday Night and then taught a second class here in Manhattan last night. You can see the demo that she did hourly at Etsy on their webite. There are no close-ups of her work, but you can see her class samples on her blog. We were fortunate to catch her for the day between her classes and before she returned to Seattle. Several of us worked through Drawing Lab the summer that it was published. 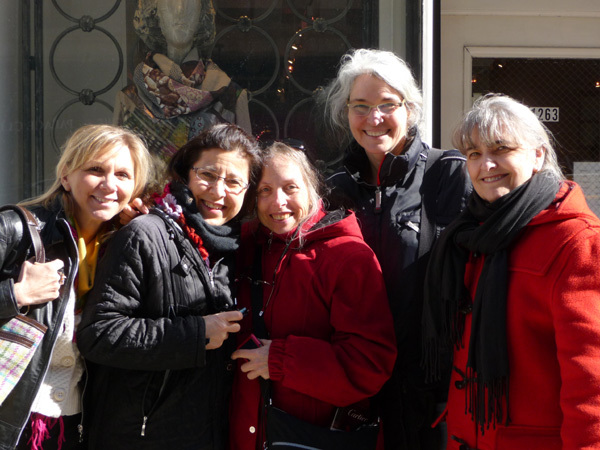 Teri taught an online group based around the book and met Carla before in the virtual world. Pat actually did thye 100 faces Lab and has her 100 faces on tags and easily portable. Carla loved them! I'm still finishing a few of the labs in the last 2 chapters - I was derailed in the Nature chapter by all of the snow and ice we had during January and February. It was a thrill to discuss her art background, her current activities, and to share sketchbooks over a long lesiurely lunch. Following lunch, we took a short walk down Madison to the Guggenheim Museum. I stopped a stranger on the street so we could have a group photo to send to Melanie. The current exhibit at the Guggenheim was wonderful and we spent several hours on the spiral walkway in the rotunda. There were 100 pieces of art from the Guggenheim Collection - to review the great upheaval in the art world between 1910 - when artists began to form groups in Europe, write manifestos to be shared with the public, and move in new directions. This period ended abruptly in 1914 when War was declared and "artists were snatched back to their mother countries to join in the war effort." The Guggenheim doesn't have an online catalogue of the paintings, but does have an informational video about the exhibit on their website. No photographs were permitted so I sketched elements of one of my favorite paintings and then painted it at home last night from a purchased postcard. 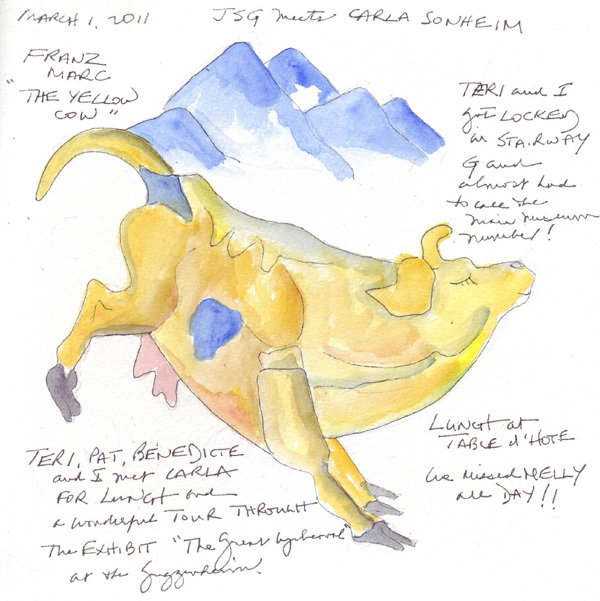 This is Franz Marc's "Yellow Cow." My cow is shorter and plumper than the original. I went back to the Met on Holiday Monday with my friend Judy and I saw two more new exhibits. Guitar Heroes is a collection of guitars, violins, mandolins, lutes, and even a ukulele - the guitars from the 1930s on and most others several hundred years old and beautiful. 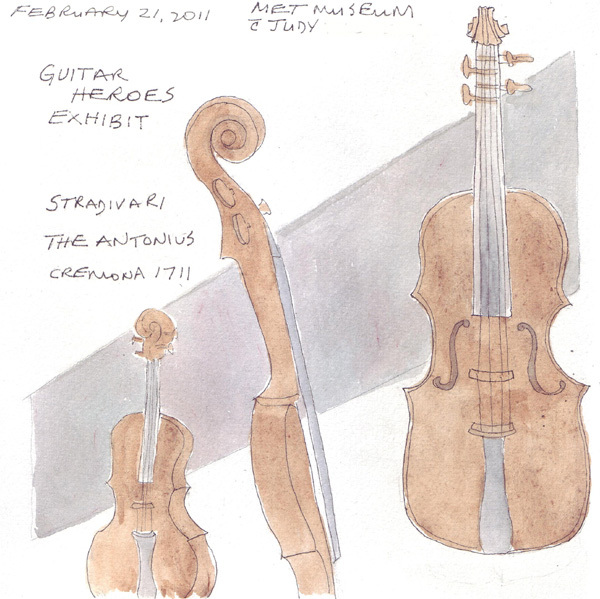 Drawing a Stradivari violin from 3 views was a real treat. There is a wonderful website for anyone wanting to look, listen, and draw. Cezanne's Card Players is very special to me. 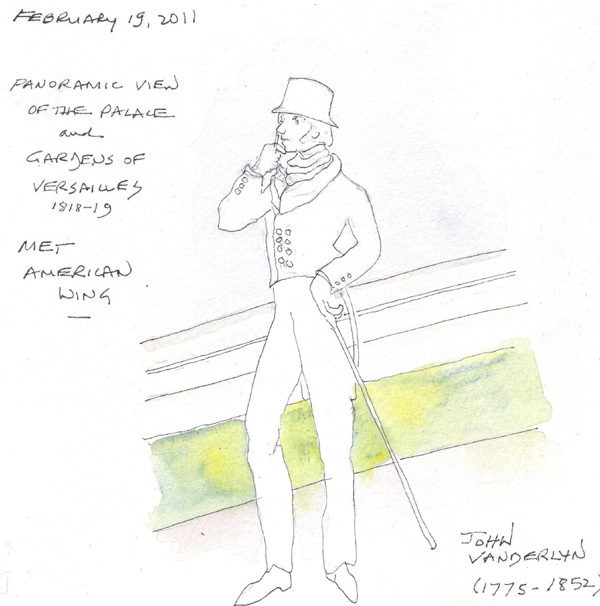 In 2007, I selected the Met version of the painting for in depth study - and drew and painted it several times in my sketchbook. You can read about the impetus and see my first versions here. 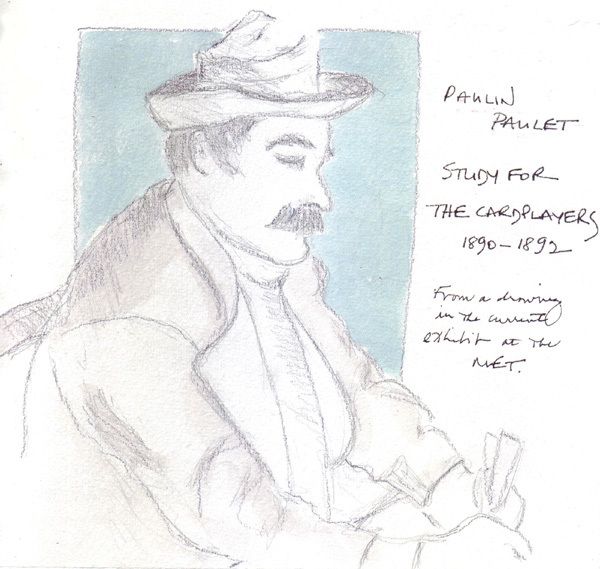 Last year I sketched only the standing peasant - and on Monday I copied a preparatory drawing by Cezanne of Paulin Poulet, the seated card player on the left in the Met painting. By the end of the exhibit, I think I will be there weekly! This exhibit was organized by the Courtauld Gallery in London and the Met. The best coverage is on the Courtauld website, with 3 short podcasts. The 5 Card Player paintings and the preparatory paintings and drawings are considered to be part of Cezanne's most important work.